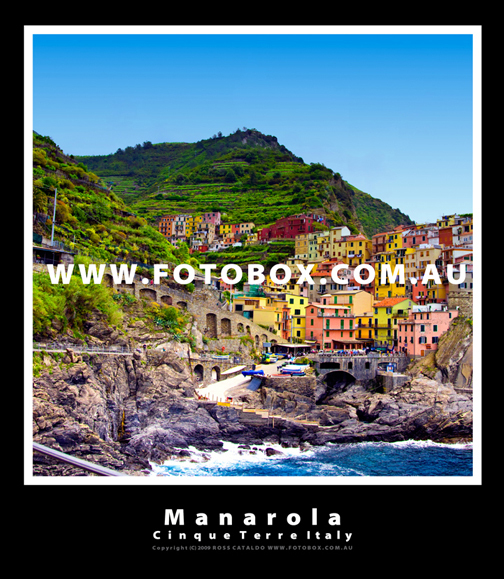 Image Information "Manarola (Manaea in the local dialect) is a small town, a frazione of the comune (municipality) of Riomaggiore, in the province of La Spezia, Liguria, northern Italy. It is the second smallest of the famous Cinque Terre towns frequented by tourists Manarola may be the oldest of the towns in the Cinque Terre, with the cornerstone of the church, San Lorenzo, dating from 1338. The local dialect is Manarolese, which is marginally different from the dialects in the nearby area. The name "Manarola" is probably dialectical evolution of the Latin, "magna rota". In the Manarolese dialect this was changed to "magna roea" which means "large wheel", in reference to the mill wheel in the town. Manarola's primary industries have traditionally been fishing and wine-making. The local wine, called Sciacchetrà, is especially renowned; references from Roman writings mention the high quality of the wine produced in the region. In recent years, Manarola and its neighboring towns have become popular tourist destinations, particularly in the summer months. Tourist attractions in the region include a famous walking trail between Manarola and Riomaggiore (called Via dell'Amore, "Love's Trail") and hiking trails in the hills and vineyards above the town"